OnePlus has been in the spotlight recently for all the wrong reasons, and today we can add one more to the list. 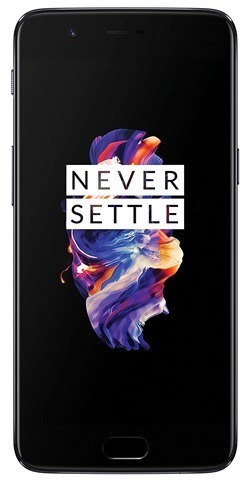 OnePlus posted a new ad on twitter, with an image of its latest flagship, the OnePlus 5, with the grey variant of the phone and the words "Mr. Gray will see you now". That's Gray, as in the American spelling of the colour grey. While this may seem like a smart tweet, it is in fact a shameless copy of the Moto M ad, as noted first by iGyaan. The original ad carried a photo of the Moto M and the message "Mr.Grey will see you now", was posted in February, with the correct British/Indian spelling of grey. Mr. Grey is ready to see you all, are you? #HelloGrey. It appears that the design of the iPhone 7 Plus was not the only thing which OnePlus copied. But OnePlus appears to be going out of its way in advertising the phone. As if gaming the benchmarks and sending push notifications to OnePlus 3/3T owners about the OnePlus 5 was not bad, the self proclaimed “we are a small company” has been investing a lot in ads from Bollywood Stars, to ad placement at airports.. But is copying the Moto M ad too far? We thing it is certainly unethical, misleading, and highlights a lack of creativity. Motorola replied to the tweet with a brilliant reply, “ One of their 50 shades of "inspiration".”, highlighting how OnePlus has been copying everything willy nilly. OnePlus India shot a lame reply with “Our gray is 50 shades darker!”, meaning their phone has a darker shade, but it just wasn’t funny. Oh and here is a hilarious epic fail tweet (now deleted), where OnePlus support or a bot. 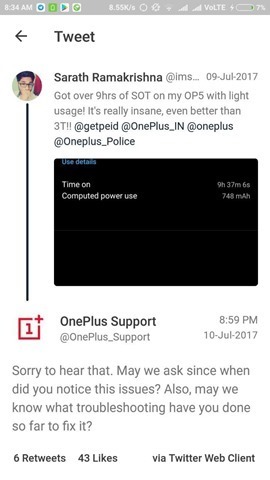 replied to a user who praised the battery life on the OnePlus 5. Not cool OnePlus, you are going from a company we loved and respected to the worst one. OnePlus copies Moto M ad in India.